Over a two hundred Fighting Machinists attended the 2018 Western Territory Officer and staff conference in Portland, OR. They spent their weekend in fellowship and learning with the aim of strengthening the IAM at every level. 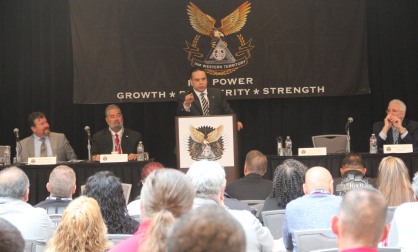 The attendees experienced a full agenda of speakers and workshops on an array of subjects including organizing, bargaining, the importance of inclusion and diversity all designed and presented with the intention of improving the lives of IAM members, their families and the communities they live in. Western Territory General Vice President Gary Allen spoke passionately, emphasizing the moral and ethical imperative of improving the lives of working families. 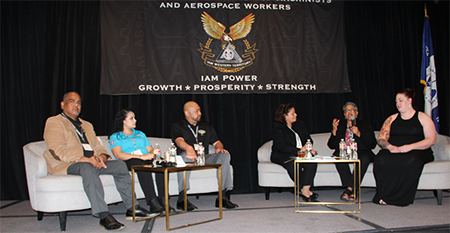 Diversity & Inclusion Panel at the Western Territory Conference discussing ways that IAM members have been impacted by diversity and inclusion in their lives. From left to right: Okesene Iese, Natalie Gonzalez, Jason Chan; moderators Rhonda Rogers and Maria Lillis; Fleeta Loflin, and Jessica Demming. U.S. Senator Jeff Merkley, son of a Machinist and raised in a middle-class home, spoke of the power of unions and collective bargaining. “Workers deserve the fair share of the wealth they helped create,” said Merkley.